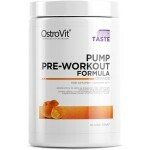 OstroVit PRE-AMINO (true taste) is a carefully selected mix of ingredients that mutually reinforce the intensity and effectiveness of exercise. This product is designed for athletes who want to achieve the maximum results of their workouts. 400 g in the package! the product contains 20 servings! PRE-AMINO is a unique combination of BCAA, whey protein hydrolyzate, A-AKG, beta-alanine and citrulline malate. BCAA and OPTIPEP Whey Protein Hydrolyzate are one of the most important building blocks of muscle cells, especially during training. A-AKG, or alpha-ketoglutarate, is a precursor in the nitric oxide synthesis process, it helps to increase the absorption of amino acids being the building blocks of muscle tissue. In addition, the high arginine content increases the blood flow to the muscles of the training session, which will contribute to achieving the maximum muscle pump. CRUTRIC CYTRULINE increases and sustains the result obtained by the action of L-arginine alpha-ketoglutarate thanks to which the effect of maximum muscle perfusion lasts longer. 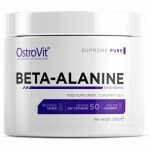 BETA ALANINA effectively reduces physical fatigue during training, and also improves endurance and endurance of the body. 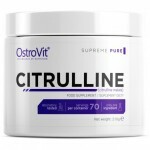 Dietary supplement OstroVit PRE-AMINO is a complex of substances that enhance the growth of muscle mass and mobilize the body for more and more intensive training. Greatly increases the training possibilities of the body. It does not contain stimulants. Reduces post-workout physical and mental fatigue. It increases the endurance and endurance of the body. It accelerates the construction of muscle mass. 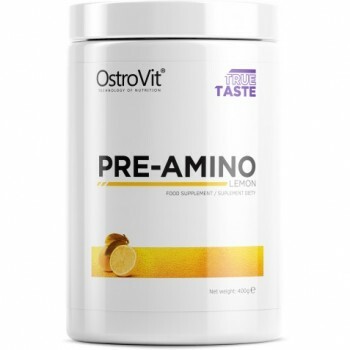 What is in Ostrovit Pre Amino? BCAA branched amino acids (L-leucine, L-valine, L-isoleucine), hydrolysed whey protein from milk , alpha-ketoglutarate of L-arginine, beta-alanine, citrulline malate, emulsifier - rapeseed lecithin, flavor, sweeteners sucralose , acesulfame K.
May contain soy and nuts. Add 20 g (4 scoops) in 100-150 ml of water or juice. On workout days, eat one serving a day 30 minutes before training . 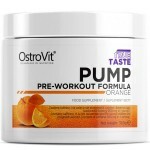 Ostrovit Pump Pre Workout PUMP PRE-..
Ostrovit Citrulline Reduces body fatigu..
OSTROVIT SHOT 60 MLWould you like t.. The non-carbonated beverage contains gua..